One thing jumped out at me this week that seemed to kind of fly under the radar. The fact that Toronto has five so-called ‘Gladue courts’ and Manitoba has yet to implement even one. What is Gladue? Essentially, it’s a response by the justice system to the fact that aboriginal people are vastly over-represented in Canada’s prison system within the context of the total population. fully one quarter of Canadian prisoners are Aboriginal, while Aboriginal people only make up less than 4% of the overall population. On the prairies, the numbers are even worse. Over 70% of Manitoba prisoners are Aboriginal people. One might think that Manitoba would be one of the first provinces in Canada to implement the court, given the numbers quoted by Parkes. How is the Gladue Court Different from a Regular Court? •	The types of sentencing procedures and sanctions that may be appropriate in the circumstances to the offender due to his or her Aboriginal heritage, including the examination of alternative justice processes such as Restorative Justice. … It is a fact that Aboriginal offenders respond better to a Restorative Justice model which advocates sharing, reparation and a holistic approach rather than the discriminations, adversarial stance and incarceration that is often synonymous with the Criminal Justice system. What’s interesting to note, as well, is that despite the existence of such courts, it’s appeared to do little to address the reason they were established: gross over-representation. As one of Manitoba’s top judges suggested to The Freep the other day, maybe it’s putting the cart before the horse. 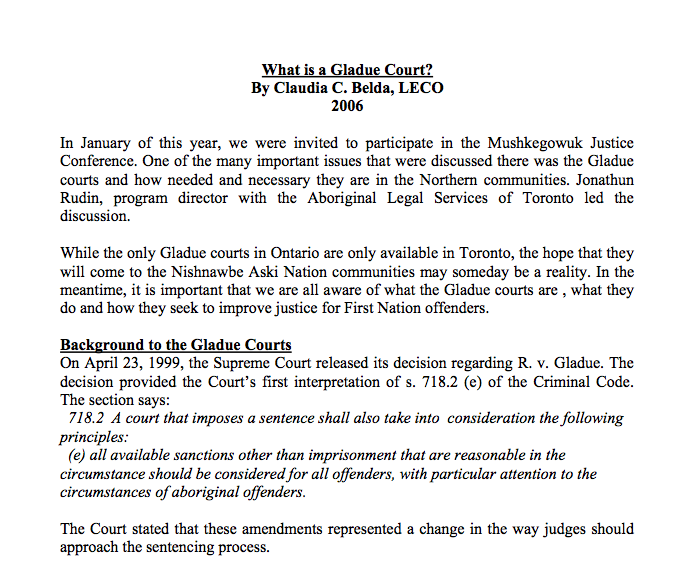 “Do we need to create a specialized Gladue court in Manitoba? We may need to do that here. But it’s not going to be easy,” Chief Judge Ken Champagne of Manitoba’s Provincial Court said. “Poverty is the biggest issue for aboriginal people in Manitoba. Is a Gladue court going to be able to address that? You also need a lot of resources at the front end: in education, training and social services,” Champagne said. On another note, it’s refreshing to see a judge saying something in a public forum. In my opinion, too often they’re silent on issues the public cares about. 2] Add to the above this story of a murder trial postponed because of underrepresentation of aboriginal people on the jury. Strikes me that this is a problem here in Manitoba too. Take for example the jury trial of a teen Indian Posse gangster who went on a shooting spree at a Weston-area home, killing three. If I remember correctly, there wasn’t one aboriginal person on his jury either. 3] Couple of major criminal cases went forward with resolutions this week. First, the woman who abducted a baby from a home and slammed it into a sidewalk pleaded guilty. And yes, a Gladue report has been ordered to examine the circumstances of Nikita Eaglestick’s background. Second, a boy who brutally murdered a kid he was babysitting on Little Grand Rapids First Nation was sentenced to the maximum allowable under the YCJA. Questioned by police, the accused had little explanation for the attack, except to say “he wanted to try it out” and that he “felt nothing” after Tristian was dead. The accused hauled water from a nearby lake to clean up the murder scene. “For all the blood-letting that happened … (there was) very little forensic evidence,” Sharma said. Equally as interesting is the fact the Crown says it was forced to accept a plea deal (and therefore not be able to sentence this guy as an adult) because the investigating officers violated the accused’s rights under youth justice laws by not following proper procedure for young offenders. I remember a couple of days after the victim was killed I bumped into a Correctional Officer who said the accused had just been brought into Winnipeg. The guard admitted being appalled at what the allegations were against him and indicated the now-convicted murderer was likely insane. I guess now, more than two years later, we have some indication of how true that is. 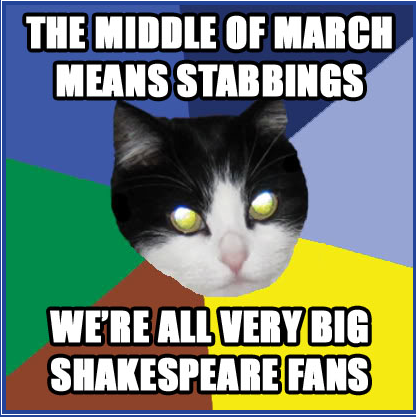 4] As Winnipeg mops up it’s 8th homicide of 2011 (in what’s been a very ‘stabby’ week), one realizes gang and drug-riddled Vancouver is only on number 2 of the year. 5] Scared Straight? Teens conducting a break-in and subsequent car theft enter a home where a man was apparently already dead. Maybe they saw him and bolted, maybe they didn’t. A truly bizarre set of circumstances. 6] The more I read over the U.S. court documents regarding the mysterious disappearance of two Winnipeg university students accused of terrorism-related offences, the more it seems like the plot of a spy novel. The most interesting stuff I’ve come across so far are the stories relating to an already arrested co-accused, who the FBI claims travelled to Pakistan and received military weapons and tactical training for jihad from a man named in documents as Yusef. In an unsealed indictment against Ferid Imam, one of the missing students, U.S. prosecutors say he went by the alias Yousef. Lawyers for the arrested man are working to have a long statement he gave to the FBI in January 2010 tossed out on the belief he was represented by counsel and police had no right to question him. No matter what, it’s going to be an interesting case — but one wonders if Imam or Yar will ever be apprehended. [He] and the others walked into the hotel, which was about fifteen minutes from the house, and checked themselves in. Again, [he] was asked not to speak to anyone as his English would get them into trouble. [he] believes this hotel either belonged to, or was associated with the Taliban. [He and two others] were provided with a room that contained only two beds but an additional one was brought in for them. Their room had its own bathroom for their use. There were other men in the twenties who were also staying at this same hotel, but very little talking amongst the men took place. The next day, the group left … and drove for about two to three hours until they arrived at a group of houses. [He] was brought to a house that was owned by a Pashtun man … [He] and the others were introduced to the man, in English as Yusef [ph] … [He] stayed at Yusef’s house for about two weeks, During these two weeks, Yusef provided [him] with both religious and military weapons training. With the assistance of an English speaking Arab, Yusef also provided religious instructions on the rewards of fighting and dying for jihad. Yusef spoke Pashtu, Arabic and English with a clean American accent. Yusef was approximately 20 years old and was of African descent. In spite of his American accented English, [he] did not know whether Yusef had lived in the west. A typical day consisted of waking up early to eat since it was Ramadan, praying and receiving classroom-type weapons training. [He] and the others did not spend too much time outdoors in the daytime as there was the fear of a missile strike coming from the unmanned drones that were overhead. These drones could be heard and sometimes seen flying in the skies overhead. They would take shifts throughout the night were each was responsible for guarding the house against an attack. [He] was trained on the AK-47, the PK machine gun — which [he] referred to as the “peeka” and the rocket propelled grenade launcher. … this weapons training culminated with one day where [he] was brought up in to the mountainous area to fire the weapons. [He] shot thirty rounds from an AK-47 and one rocket propelled grenade at a target on the mountainside. [He] never shot the weapons at U.S. troops, abandoned vehicles, or anything other than the side of the mountain. 7] Finally, it looks as if the USA’s decision to drop escape charges against Ian Jackson MacDonald were tactical in nature. 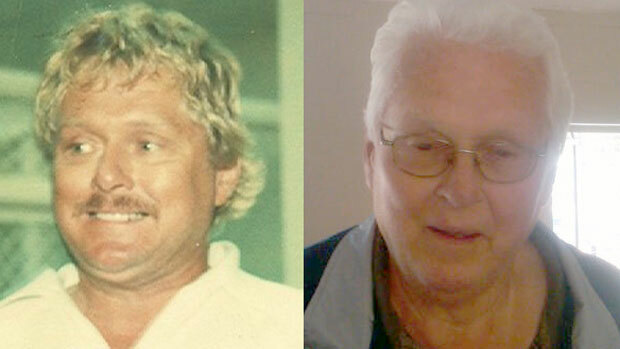 Just a few days after they did so, the once burly MacDonald was wheeled onto a jet in the company of RCMP officers and returned to Manitoba to face drug-conspiracy charges. What’s interesting to me about this is that the Canadian warrant for MacDonald was never wiped off the system as part of “the normal justice process” that takes place that the Sun revealed just a few weeks back [note – at least one of the quashed warrants was from the 70s]. Why not? I dunno. The warrant’s a dusty 30 years old, and it’s a non-violent offence. MacDonald, by many accounts, is now a sick old man. What’s the point of prosecuting him?